The Blue & White Clouser Minnow is a variant of a deep water bone fish pattern. The key to its success is in the twisting, turning and diving action. Always keep the fly in motion, allow the Clouser Minnow to do its job and imitate the bait fish action when fleeing from a predator. Eyes : Lead, painted light blue, with black pupils. Wing : White buck tail on top, light blue buck tail underside with pearlescent crystal flash in between. 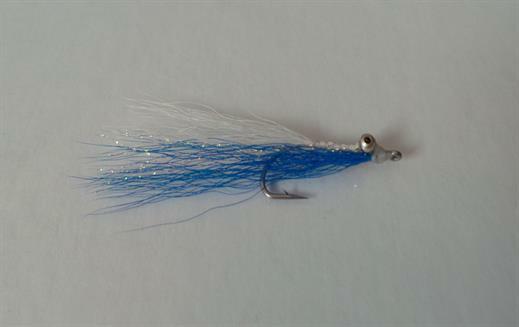 Currently there are no comments about the Blue & White Clouser Minnow fly pattern from other fly fishermen yet.